Assoc. Prof. Gasinee Witoonchart, Rector and Asst. 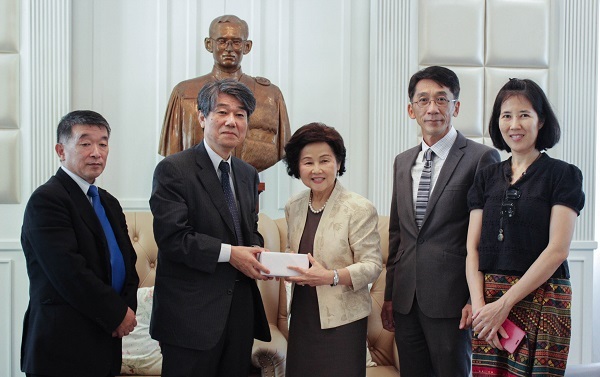 Prof. Dr. Prinya Thaewanarumitkul, Vice Rector for Sustainability and Administration (Rangsit Center) and faculty member from the Faculty of Engineering met with Dr. Kenji Higashida, Executive Director on International Affairs of NIT (KOSEN), President of NIT Sasebo College, and a delegate from NIT, to discuss KOSEN education system which is 5 year engineering study. Thammasat University agreed to co-host the International Seminar on Technology for Sustainability (ISTS) in 2019.